If you're needing a versatile and innovative crane for your job, a Tadano Mantis crane is the perfect fit. Among the many quality Tadano Mantis cranes is the hydraulic crawler crane. 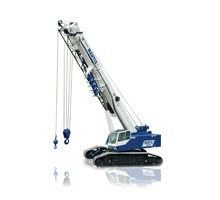 The distinctive features on this crane are the crawlers the crane travels on. These crawlers are like those used by tanks, allowing the cranes flexibility that ordinary cranes do not have without extensive outrigger extension. This crawler feature helps the crane work well in wet or swampy environments. The crawler beams can be extended from 12 to 19 feet. The GTC-1200 telescopic 5-stage boom gives a lift capacity of 130 tons. It can be extended up to 155 feet, or up to 269 feet with the jib. The tracks give the GTC series the ability to not only pick up a load but to "walk with it" or move it, as well. This unique ability has almost limitless applications in a large number of industries and settings. The hydraulic tracks are only one of many unique features. At the factory, the GTC 1200 disassembles itself for shipping with minimal supervision. At the destination, the Tadano Mantis crane reassembles in the same manner. The crane also has the invaluable feature of remote operation. This ability to operate from a distance, without an operator in the cab, is an indispensable safety feature in many hazardous industrial settings. Tadano Mantis brings the highest quality of one of the finest manufacturers of crane equipment in the world to your project, whether in its unique hydraulic crawler crane or any of the others it manufactures. Scott-Macon Equipment handles sales, rentals, and service for Tadano Mantis cranes. We can help you determine whether purchase or Tadano Mantis crane rental is the most effective for your particular situation. We have service centers throughout Texas, Louisiana, and Oklahoma. Our rental fleet of cranes is one of the largest in North America, and our reputation has been built on the solid foundation of sales, rental, and service support.